Come celebrate Cinco de Mayo with a little Cape Cod-flavored history of Mexico. 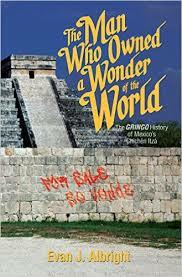 Award-winning local author Evan J. Albright talks about his latest release The Man Who Owned a Wonder of the World: The Gringo’s History of Mexico’s Chichén Itzá. Today the ancient Maya city of Chichén Itzá in Yucatán, Mexico, is considered one of the new Seven Wonders of the World. This amazing ruin, famous for its giant pyramid, possesses a little known secret—it was owned by a Cape Cod man from West Falmouth, Edward Herbert Thompson. In this incredible true story, Albright traveled to Mexico to discover how Thompson could come to possess one of the greatest archaeological jewels of Mexico. Over the course of ten years, Albright traced Thompson’s explorations across the Yucatán Peninsula, only to stumble upon the archaeologist’s biggest secret —the son he left behind!